8732 Toa Matoro is a BIONICLE set released in 2006. He is one of the six Toa Inika. This is Matoro's second appearance in a set. It contains Matoro, his Energized Ice Sword that lights up, and a Zamor Sphere launcher. In the BIONICLE storyline he was a Toa of Ice. He wore the Iden, the Great Mask of Spirit. He was transformed into a Toa by a bolt of lightning from the Red Star. This is a description taken from LEGO.com. Please do not modify it. (see an archive of the product's page) A blizzard of ice! A blast of frigid air … a blizzard of ice … Toa Inika Matoro has arrived! 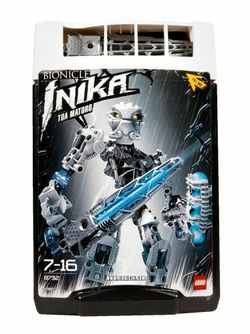 The Toa Inika of Ice combines his elemental cold power with pure lightning to stop the Piraka. He carries an energized ice sword, a zamor sphere launcher, and wears the Kanohi Iden, the Mask of Spirit. Energy sword lights up with a strobe effect! Facts about "8732 Toa Matoro"